Hristo Groove - programming, sinth, ets. HISTORY; The group has existed since1994 under different names and with various musicians. "NOT-YET", "SHANGRY LA" and "PERFECT BLUE". 1998 till now- as "BLUBA LU"
The concept is megamix of different difeerent traditional sound patterns, sampled synthesised and bent by the artists as a backround for their own ideas. The group is looking for its own image in the playing and processing of soundz.The work in studio is the third final periodin the process of creating music after the concerts and rehearsals.The music is developed in a long concentrated embrionic phase.The lyrics are in english , sanscrit and one abstract language invented by the group.Bluba Lu seeks interaction between its music and the world one . Last works of the group are experimental flud jazzy beat expression. 02.01 - the first single released from yellomusic, emblematicly called YELLOW SUN. 04.Y2K- the single "RATAKAM" was included in a rare CD compilation for modern Bulgarian music NEW RHYTHM . 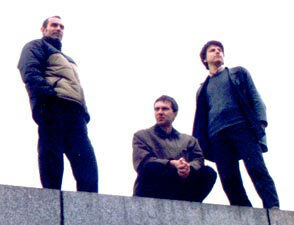 BLUBA LU participated in the second round of the "SOUND OF PASSPORT" CONTEST.